Try Kneipp Quality Bath, Body & Tea Products Today! You are here:Home » Product Reviews » Try Kneipp Quality Bath, Body & Tea Products Today! Kneipp has been producing high-quality pharmaceutical, bath products, dietary & body care for generations. The five elements of Kneipp’s philosophy – Water, Plants, Exercise, Diet & Inner Balance – are a unique complement to Kneipp’s product concepts. New to the products? Celebrities like Victoria Beckham, Britney Spears & even Richard Gere are using Kneipp products! Join these celebrities to find out why Kneipp is so popular + a Giveaway coming to you soon! Formulated from the purest natural herbs &a high concentration of essential oils, Kneipp's range of bath & body products are of an unparalleled quality. Bathe away stress, strain & fatigue with these powerful herbal baths. Highly-concentrated essential oils interact with the power of the warm water, releasing them to be absorbed through the skin & inhaled, thus benefiting body & mind. This bath treatment with essential oils of Valerian & Hops essences promotes relaxation & a sound night´s sleep. Additional Lavender essential oil gives it a balancing effect on body & mind. If you suffer from nervous restlessness & disturbed sleep Kneipp recommends a "half-bath" in moderately warm water with Kneipp Valerian & Hops Herbal Bath. While taking a "half-bath" the lower part of the body is submerged to the waist. The upper part of the body should remain clothed. Bath should be taken during the afternoon or evening at 36-37°C for 10 minutes. * Best results will be obtained when you either sleep or rest after taking your soak. If you don’t have a bathtub in your home, steep your arms up to your elbows & soak your feet in warm water with a few drops of Valerian & Hops essence to enjoy the relaxing power of these botanicals. Also available in: Lavender (balancing), Eucalyptus (sinus relief), Juniper (muscle soother), Orange & Linden Blossom (harmonising), Rosemary (invigorating), Spruce (energising), Melissa (relaxing), Wildflower (calming). This gentle yet thorough balancing body wash, soothingly cleanses with natural essential oils leaving your skin healthy, supple & delicately scented. Relieves stress & helps balance & relax both your body & mind. *Tip: Leave the Kneipp Herbal Body Wash on the skin for a short period of time to experience the maximum benefits of the Essential oils before rinsing off. Follow with various Kneipp Body Lotions or Body Oils. Available in: Mint & Eucalyptus (sinus relief), Lavender (balancing), Juniper (muscle soother), Orange & Linden Blossom (harmonising), Rosemary (invigorating). Essential Lavender oil has a balancing effect on body & mind. It helps combat mental & physical fatigue. A combination of intensely pampering plant oils & carefully selected natural Lavender essential oils, this light massage oil spreads easily & absorbs slowly to ensure you enjoy the maximum benefits of a relaxing massage. The high amount of emollient Jojoba oil & sweet Almond oil help to regulate the skin’s natural hydration levels. Muscles only! Do not massage directly on bones. Use upward strokes toward the heart. Always keep contact with skin. Listen to your inner voice”- follow your intuition. 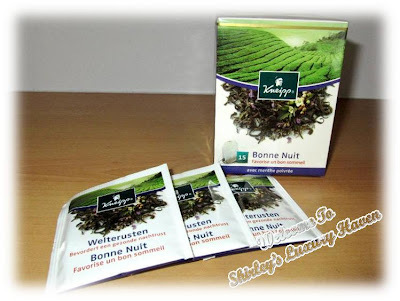 Kneipp Herbal Teas are naturally caffeine-free & contains no artificial colouring, aromas or flavouring. 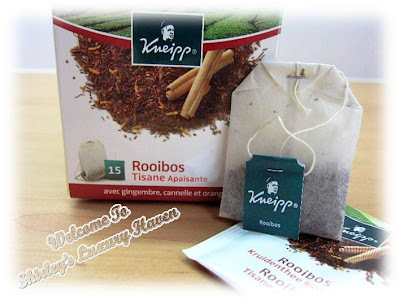 Kneipp Rooibos Tea owes its characteristic flavour & red- brown colour to the South African sun. Rooibos is naturally calming & is rich in antioxidants. This delicious Rooibos tea with a hint of Cinnamon, Ginger & Orange is warming & calming. Good Night Herbal Tea has a relaxing effect & promotes a healthy night’s sleep. Valerian is well know for its calming properties, a relaxing effect that is enhanced in combination with Lavender & Lemon Balm. Good for people who struggle to fall asleep at night. *Drink tea half an hour before sleep. Wanna try Kneipp's range of products? Head over to Giveaway: Kneipp Bath, Body & Tea Products Worth Over S$400 now, with 13 prizes to be won!! Bess, you must've missed this brand. They've a strong presence in US. Look out for it the next time u go shopping! You can find few products in GNC Vitamin Stores. Hope this helps. Shirley thanks for such info. They look great for a great price also. Awesome share! Thks for adding this! I love the body wash and massage oil, you know I am always on the lookout for new products to try out. Let me see whether I can find the same at our Guardian. Nava, u're always very adventurous. I'm pretty sure they're also selling in M'sia. Have fun! Love the philosophy behind these products. Also, they do look like a great way to pamper yourself. We always are in need of that! Tina, oh yes..... Kneipp has a long history way back & impressive philosoply. Love their wide range of products! wow very nice herbal products u got! Charmaine, these products are sooooooooo pampering. Hahaha! based on the upper there comment, I think this product is really good!! wow!! Valerian is one of my fave oils for relaxation. I use it a little on nights when I am too worked up to sleep.